The Agony of the Cat Tree | MEOW hear this! My cats need a cat tree. I am sick of them perching on things they shouldn’t be perching on. I feel they are desperate for a cat tree. First of all, can anyone tell me why cat trees are so expensive? It’s wood. And carpet. I haven’t priced out carpet or anything but wood ain’t that bad. I’m a handy girl. I craft. I refer to Home Depot as Michael’s on Crack. I have a Dremel, even, and a fancy accessory kit for it. I can use a real drill, too. I can sand with the best of them. Even with a power sander. Yup, I’m that awesome. I am a little iffy about using saws. As a superklutz, a spinning wheel of doom may not be what the doctor ordered. Even the boyfriend cut his knuckle on one, nicked a tendon and ended up needing surgery (he wasn’t even going to go to the ER, silly boy). But hey, they can do that for me at Home Depot. The reason I’m thinking about making rather than buying is that I cannot find one that I like in a reasonable price range. I’m not really surprised. I can go to TJ Maxx or Marshalls or whatever and manage to only like the most expensive thing in there. It’s like this horrible gift I have. This Wohnblock one is awesome. It’s also 1590,00 €. I have no idea what that converts to in U.S. dollars but it sure as HELL isn’t in my price range. Catswall. Also super awesome. But guess what? ONLY AVAILABLE IN TAIWAN. Way to go, America. We can’t even win the cat tree race. Back to reality, and the cat trees I CAN afford. They kinda all look the same, and boring. Also somewhat cheap and unsturdy, but that’s me being picky. Which brings me back to making one. I hate paying money for something that I feel like I can make myself. I think I’m going to attempt it today on my day off. I’ll at LEAST try the carpet store. If I don’t blog for awhile, it’s because I put a nail through a body part or something. I bought a very cheap cat tree from Wal-Mart. Though it looks boring to me, my cats love it. I love both the ones you posted! Good luck trying to make one. So far I have only accomplished buying the plans. One step forward! 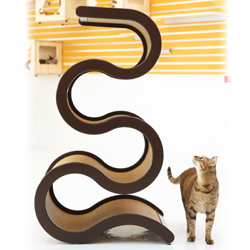 I’d imagine a lot of the priceyness of cat trees is the size and weight. They take up a lot of space to ship and hold in inventory. You can always use a hand saw for a cat tree. There aren’t that many cuts, or have them cut the material at the store into convenient sizes. Back in the day, I made these little boxes (think one shelf of a bookshelf on its own) and made a two-sided bookcase wall, higher on one end so the cats could run up and down it or lie on the different levels. The cats liked it a lot, and the books kept it from falling over. Hah I actually am more likely to injure myself on whatever the “safer” option is. That sounds like an interesting idea, though. My friend used ikea shelves on her wall for cat climbing, maybe I could do something similar with the boxes you suggested, like steps, rather than a tree or hang shelves on the wall. Plus, I DO have a lot of books! Sigh. That is somewhat disheartening, as I was planning on relying on the boyfriend’s construction expertise to help. Please! Not the expensive one. Take a trip somewhere instead! My husband and I go to the local Habitat for Humanity thrift store If you don’t have that, you probably have some discount lumber and supply store (less expensive than Home Depot) and buy an assortment of wood and carpet remnants and then build away. Uh, I design, he builds. I’m tool-deprived, so to speak, and he refuses to make another emergency room trip. We just make our own and our three very picky cats love them. Well, at least they shred them, sleep on them and fight over them so I think that means they love them! Well, yes, there is that to consider! Wow those things are amazing! My cats would adore that top one! I change my mind every 5 minutes, though, so that’s a task in itself. 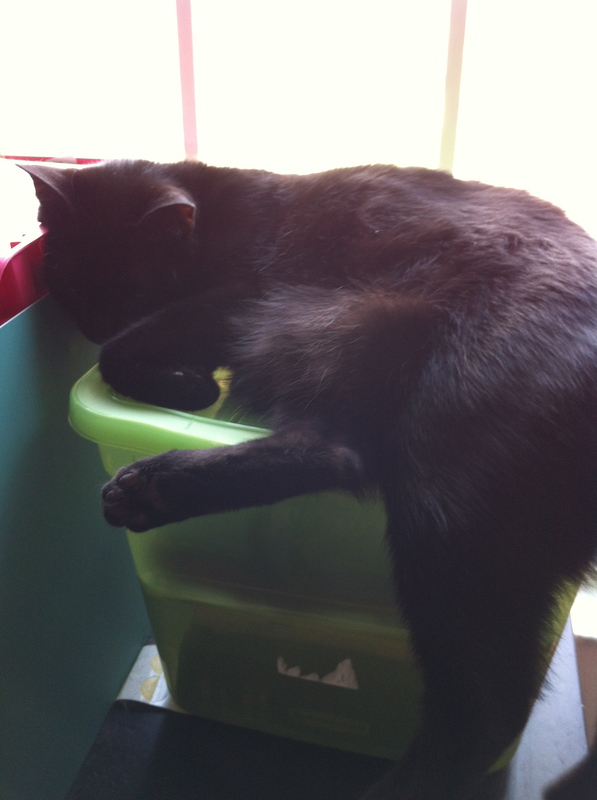 November 23, 2012 - 3:23 pm Pingback: I doubt cats would approve of Black Friday. « MEOW hear this! January 26, 2013 - 11:52 am Pingback: What will YOU do with your tax refund? « MEOW hear this! February 16, 2013 - 3:39 pm Pingback: Not so patiently waiting. « MEOW hear this! Oof. Guess I need to get on that “playing the lotto” thing.